Are you ready to achieve virtually anything you want, even if you’ve failed at every goal you’ve ever set? These 13 “secrets” are the proven formula used by world-class achievers across the ages. This is a book for everyone who has ever had a dream. This book will teach you how to set goals and achieve that dream, step-by-step and day-by-day. You’ll discover some great news! If you’ve been struggling, if you’ve ever felt like you were going “nowhere fast,” you’ll learn that it’s not because there’s something intrinsically wrong with you. You’ll learn, instead, that it has a lot to do with ways of thinking that you’ve adopted in the past. This is great news because you can change the way you think, speak, and act. Success isn’t the result of winning some sort of lottery. It’s the result of applying the right principles with the right action and the right mindset. Despite being totally unknown in the personal development industry when he launched his first website in 2001, Vic Johnson has gone on to become an international expert in goal setting and host of the popular TSTN show Goals 2 Go. He is the Founder of Goals2Go.com . Evicted from his home in 1996 and his last car lost to repossession a year later, his story has become an oft-quoted source of inspiration to the more than 300,000 subscribers he serves worldwide. He is the author of the bestselling book Day by Day with James Allen and has appeared in numerous video programs with Bob Proctor, Jim Rohn, Brian Tracy, Denis Waitley and Mark Victor Hansen. So here it is, a straight up review. If you are ready for the next step, feel that there something more, have an insight and need that qualifying push; then this is what you are looking for. And if you found this book, it wasn't by accident, so read it on purpose as well as with purpose. Remember, that "the universe responds more steadily and readily to the organized mind". 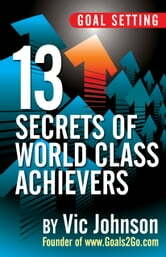 Goal Setting 13 Secret of World Class Achievers. Very good. Easy to understand. A very good book as a Goal Achievement guild book. Strongly Recommended.